Three “grow-with-me” stages and two rainforest friends make bath time more relaxing and fun for everyone! Soft, padded sling comfortably cradles newborns in Fisher-Price Rainforest Friends Tub. When baby outgrows the removable sling, the “baby-stopper” insert keeps baby comfortably reclined—no slipping or sliding around! Insert removes, too, so toddlers can sit up and play in a roomy tub just their size. Hippo pouring cup and alligator strainer are handy tools for bathing, and fun bath friends for play! Soft-sling for newborns brings bath time down to size for the littlest of bathers! Removable sling featuring adorable rainforest friends gently cradles newborns in comfort, security, and the soothing, warming sensation of water—making bath time a more pleasant experience for both of you. Hippo strainer and alligator pouring cup are handy baby-friendly tools for gentle bathing and rinsing. Plug makes the tub quick and easy to drain; hook makes it quick and easy hang-dry and store! Babies can be slippery when wet! And making baby feel secure in the bath is key to a happy bath time experience. 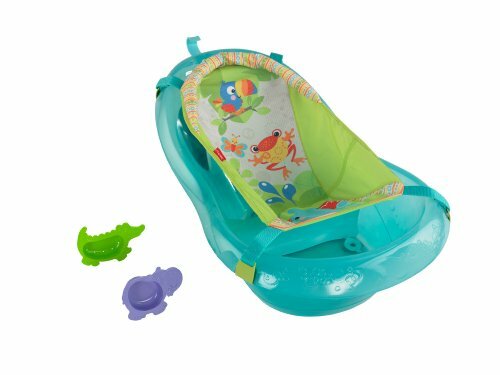 Fisher-Price Rainforest Friends Tub’s “baby-stopper” insert and comfortable foam-padded surface help prevent baby from slipping and sliding around in the tub, making you both feel more comfortable and secure. 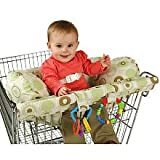 It positions baby at a comfortable recline for bathing and play, and easily removes when baby is ready to sit up for tub time. 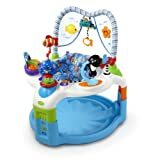 Alligator and hippo toys encourage baby to discover water play fun—scooping, straining, and pouring!